Make the book 99c/99p during the pre-order period, and let the world know that the book is at a special price prior to release, make sure you also tell them how much the book will be after release. This advice is obviously based on the notion that most people like to get a bargain, especially when they know how much they’re saving, and how much time they have in which to make that saving. It’s a simple concept but it’s one that didn’t occur to me until it was pointed out, of course, I’m not marketing savvy so that might be why. Okay, since I’ve now been hit over the head with what I should have already known, I have reduced the price of my upcoming novel, Written In Blood; you can now get my serial-killer thriller for just 99c/99p if you buy it in the next 23 days, on 1st April it will go up to its full price of $3.99. No, this isn’t a post about me coming out of the closet, I am not gay, but I am making something of a reveal about myself. As those of you who have been paying attention will know, I write under the pen name of Alex R Carver, because I want to keep my writing and personal lives separate. Part of my efforts to keep the two aspects of my life independent of one another I have been using a picture of my mum’s Yorkshire Terrier as my author picture. Molly is a cute dog, and an effective way of not revealing myself, but it seems as though that is not going to be possible moving forward. I was invited to write an article for a new project recently – details are top secret right now so that’s all I can say on the subject – and as part of that I was required to provide an author picture that was actually of me. This was something of a challenge as I wanted to take part in this opportunity, but I didn’t want to be recognisable. Fortunately, there are many ways to play with an image, and using black and white as well as a touch of soft focus or some such thing (I don’t actually know what was done to the photo I took) I was able to have a picture of me where I don’t believe you could recognise me, at least not easily. If you look below you’ll see the before and after. Written In Blood is not a part of my Inspector Stone series, book 2 of which will be coming later in the year, but it is set in a village a little outside of Branton, where Inspector Stone works, and the sequel, A Bloody Rewrite (a little play on words for my writer friends) will feature characters from the series, and maybe even Inspector Stone himself, you’ll have to wait and see. A peaceful village torn apart by murder. In the small, close-knit village of Oakhurst, residents aren’t willing to believe that one of their own might be a brutal killer. So when young women begin to die – their bodies found with accusatory words carved onto their skin – suspicion falls on the newcomer to the village. Charming Zack Wild, author of violent crime novels and possessor of a dark history, seems like a perfect suspect. As they investigate, Sergeant Mitchell and Constable Turner are increasingly unwilling to believe that someone they know could be responsible for such heinous crimes. But will this affect their judgement, allowing the real killer to escape? You will be able to pre-order Written In Blood from March, and the book will then be available from April 1st. Should you bother with making a paperback? This is my second go around as a published author, I was published for a time in the early days of the indie scene, and during both my previous time as an author and my current career I have come across the question posed in this post’s header. It seems that many indies cannot see any value in having a paperback/physical version of their work out there; either they believe ebook is the way forward and paperback is dying out, or they feel it’s too difficult/time-consuming/costly to make a paperback a part of the catalogue they offer to their readers. I can’t claim to be an expert in the publishing business, whether indie or traditional, I’m just someone with a bit of experience, and I hope to help by passing on that experience to assist others. In my opinion, indie authors should release every title in both ebook and paperback versions – they should also release them as audiobooks, and in every other format possible, so long as the cost to produce is minimal; the more ways in which a title is visisble, the more likely it is to be seen, and therefore to sell. This seems like the obvious place to start, and if I’m honest, there isn’t really a counter I can give to this, the chances are, unless you’re lucky, you won’t sell many copies, at least initially. Don’t be put off by the prospect of limited sales, sales are not necessarily why you should create a paperback; it’s possible that you will get sales, and you should celebrate each one, but it is more likely that people will see your paperback and then, if they’re interested, buy the ebook as that will most likely cost them less. A paperback provides increased visibility, it is also handy to have because some reviewers, and you will want to get in touch with them at some point, will only accept paperbacks for review, and giveaways work best when the prize is a physical copy of a book (giveaways are a very effective way of getting people interested in your book without spending too much money). The last reason for having a paperback is the joy of holding something you have created; it’s nice to have your novel as an ebook, but nothing compares to being able to hold and an actual, physical book. Those who are not technically minded find adapting their ebook to a paperback format a little daunting, and I can understand that, at first glance it does seem difficult. No-one should let a little difficulty stand in the way of possibly earning some money, though, especially if that money is to be earned through something you love, like writing. I use Createspace to produce my paperbacks (other services are available) and once I have selected the size for my paperback, they provide a template to follow with all margins and interior layout prepared for me, all I have to do is copy my novel into the template and make some adjustments to ensure the chapter headings appear as I want them to. I’m lucky enough to be reasonably computer literate, so this isn’t too difficult for me; I can appreciate how it might be for others, though. Fortunately, there is a way around this, which brings me to the third reason. In addition to the interior file, you will need a cover for the paperback, one that will include front, back and spine. Obviously there are people you can contract to create a cover for you, at reasonable prices, if you don’t wish to do that, however, Createspace provides a feature whereby you can build a cover online. I appreciate that not everyone has money they can afford to throw at publishing, even when you can find formatting services for a reasonable price. Cost needn’t be a barrier to turning your ebook into a paperback, however. If you look around, especially in writer’s groups such as those on Goodreads, you’ll find other people who have services they can’t afford to pay for, people who are willing to trade the services they can do for those they can’t. This means someone may be willing to setup the interior file or design a cover for your paperback in exchange for some help with marketing, or something else that you may have a particular ability with. Whether you pay for a service or trade for it, I recommend you check out the person providing the service to be sure they will do a proper job. I hope this has helped convince you to put out a paperback and expand the visibility of your titles. The group I’m part of on Goodreads is having their first showcase of the year, it’s an event featuring books by the many members of SIA (Support for Indie Authors) a wonderful group that is incredibly supportive and filled with great people who write in just about every genre you can think of. I’ve read and enjoyed several, and got more on my TBR list. Now that 2017 has started, it’s time to look ahead to what’s in store, both personally and on the writing front. Discounting the release of my first novel, 2016 was not a very good year, I had to have a major operation early last year for a burst appendix; it was good for losing some weight but I’ve seen put all that weight back on, and things didn’t improve after that. I intend that 2017 will be a much better year. I’m not really one for resolutions, in my opinion they’re made to be broken; I do intend doing something about my waistline, though, that’s an issue I struggle with and which can’t be ignored. I need to lose some weight, so I will be eating a little healthier (mostly that means fewer cakes and chocolates) and getting a little more exercise, especially when spring arrives. 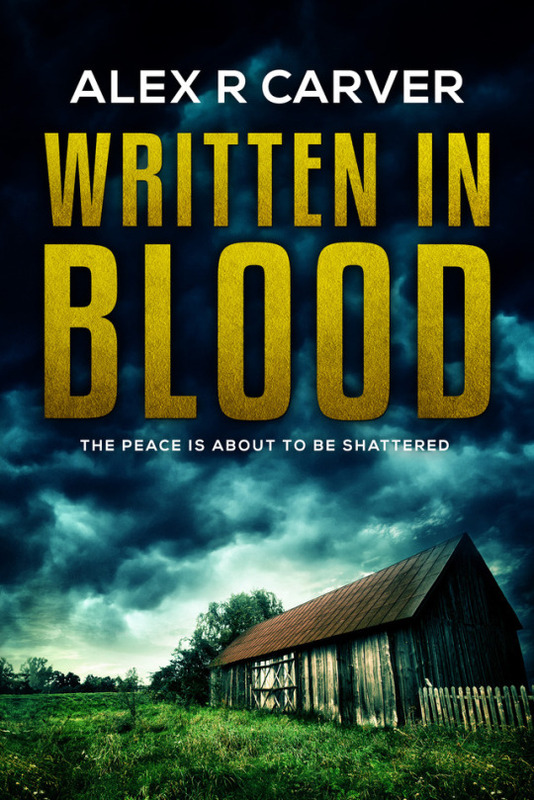 More important than my waistline, is my writing; I am currently editing my next novel, Written In Blood, a serial killer thriller set in a small village, which I hope to release in April. At the same time I am doing that, I am typing up the first draft of book 2 in my detective series, An Eye For An Eye, which currently has a release date of September. I hope to get it out sooner, and I think it’s possible, but one of my goals for the year is to reduce my stress and anxiety levels; to that end I am avoiding the urge to put too much pressure on myself by setting hard to attain goals. I also plan on releasing another short story later in the year, part of a serialised vampire story I’m working on; I have two parts of the story written, and a rough idea of where it’s going from there, but I need to flesh it out and get to work on it. Outside of releasing new titles, I want to read 15 books in the next 12 months and reach the point where each of the titles I have available for sale is being bought at the rate of at least 1 copy per day. To my mind, that’s the first step towards making a living from my books, which is my ultimate goal. With all of that said, I hope you have all had a lovely Christmas and New Year, and you got whatever it is you wished for, and the coming months are everything you could want. I posted my new short story and its cover recently, and now I’m back to tell you it’s been released and is available for free, or will, from many good ebook retailers. It already has 2 5* reviews on Smashwords, which was absolutely wonderful to wake up to. When Kirsty is attacked on her doorstep after returning from a party, she is left to wonder who is responsible, and why. A short story of approximately 8,000 words. It will be coming to other retailers soon, and will be free on Amazon as soon as I can get it price-matched.